Tui Nausori Ratu Lepani Tagicakibau (from left-facing camnera), Minister for Transport and Local Government Parveen Kumar and Nausori Taown Council CEO, Azam Khan with old Nausori Bus stand base taxi drivers yesterday. Photo: RONALD KUMAR. The Nailagobakola clan of Nausori Village has stepped in to assist Government extend the use of their land for the taxi base in Nausori town. 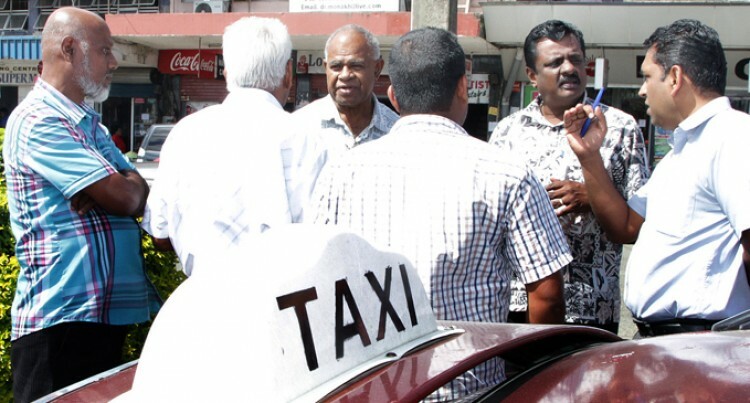 Concerns had been raised on the expiry of leases at the taxi bases in Nausori, close to the old bus stand. This was sorted out yesterday after the Komai Nausori, Ratu Lepani Tagicakibau reassured stakeholders following a meeting between the taxi operators and the Minister for Transport Parveen Kumar. Ratu Lepani said the leasing of the land, where the current taxi base was located, had expired 10 years ago and the council had been going on a tenancy at wheel basis. “We have agreed to that because we want to assist the council in developing Nausori town,” Ratu Lepani said. Concerns had been raised by taxi operators after their business took a nosedive following the relocation of the bus stand and market in Nausori. Mr Kumar yesterday met with the operators and informed them that new taxi bases would be constructed at the back of the new market within three weeks. The new base will be able to accommodate 100 taxis. Mr Kumar said he was overwhelmed with the support shown by the vanua of Nausori. “This has been an issue for us and I am happy for the chief and his clan has made us really happy,” Mr Kumar said. Meanwhile, the operators’ president Niyaz Mohammed said they were happy with the outcome of the meeting and looked forward to continuing to provide their services to the people of Nausori.